I feel like a defective typewriter. One of my favorite lines from Grease… and unfortunately, exactly how I’m feeling these days. 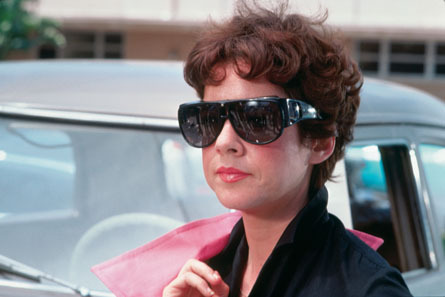 And although my reasons are different, I’m just as disappointed in my body as Rizzo was. Last month, I decided to start charting my cycles just to make sure things were working the way they should be. Theoretically, getting more familiar with what my body was doing should make conception easier once the time came, right? And in the off-chance something wasn’t right, I’d know sooner, rather than later. Well, something isn’t right. I have always had pretty regular cycles so I had no reason to think things were amiss. However, when you chart by taking your temperatures every day, you are able to actually pinpoint when ovulation occurs. For most women, it happens roughly smack dab in the middle of their cycle, The second half of your cycle is called the luteal phase and it’s supposed to be 12-17 days long. Unfortunately I’ve discovered that I ovulate very late in my cycle, and the second half of my cycle is disproportionately shorter than the first half (just 10 days). It’s borderline what they call a luteal phase defect (LPD), and it’s one of the more common causes of infertility. Ugh, just typing out that word makes me want to cry. The problem with a luteal phase defect is that it’s often a symptom of low progesterone – one of the hormones required to sustain a pregnancy. Women with a luteal phase defect usually have difficulty getting pregnant, and if they do, often have early miscarriages. So I’m freaking out a little bit. D thinks there’s nothing to worry about until I talk to a doctor, but most doctors don’t even consider fertility issues a problem until you’ve been trying for a year. Facing a year full of failed attempts or worse – failed pregnancies – just seems like the worst emotional roller coaster ever. I know miscarriage is always a possibility in any pregnancy, but when the odds are stacked against you, how to you even get excited about that first positive test, knowing it probably won’t end well? I’ve been doing a lot of research on the issue, and the good news is that LPD is usually treatable. Sometimes it can be corrected simply by getting more Vitamin B6. Sometimes over-the-counter progesterone creams will balance things out. Often, doctors will prescribe progesterone pills. If that fails, doctors usually turn to fertility-enhancing drugs such as Clomid. Clomid comes with a whole host of nasty side effects, so I’m hoping to avoid that route if possible. I have an appointment to talk to my doctor coming up, and I’m hoping she won’t just dismiss this or make us “try” for a year before doing anything, but in the meantime, I’ve started taking Vitamin B6 in the hopes that I can correct this issue in as natural a way as possible, as soon as possible. Fingers crossed. ← Say hello goodbye to my little friend.